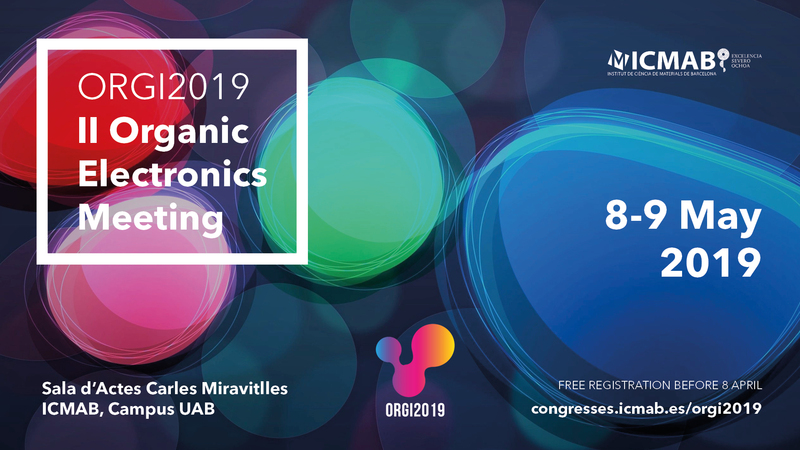 The second Organic and Molecular Electronics Meeting at ICMAB (ORGI2019) will take place on 8-9 May 2019 at ICMAB. The workshop will bring together groups from ICMAB or nearby Institutions working on different aspects in the field of Molecular Electronics with the main aim of promoting scientific collaborations and synergies among researchers. Deadline for registration and short abstract submission is 8 April 2019. ORGI 2019 is the second ICMAB workshop with the goal of sharing the last advances in the field of Organic and Molecular Electronics and fostering possible scientific collaborations among researchers from ICMAB and nearby groups. The workshop is organized within the Severo Ochoa project and will comprise invited and short contributed talks. Registration is free (with a limited number of places). You are all welcome to participate either by attending the meeting or by presenting a talk. The deadline for registration and short abstract submission is the 8th of April. The programme will be available soon, once the invited speakers and short contributed talks are ready. Rafael Cichelero, Mikko Kataja, Mariano Campoy-Quiles, and Gervasi Herranz, "Non-reciprocal diffraction in magnetoplasmonic gratings," Opt. Express 26, 34842-34852 (2018).